Hi. I use MusicBee to convert Flac to Ogg. It uses an old version of OggEnc2. 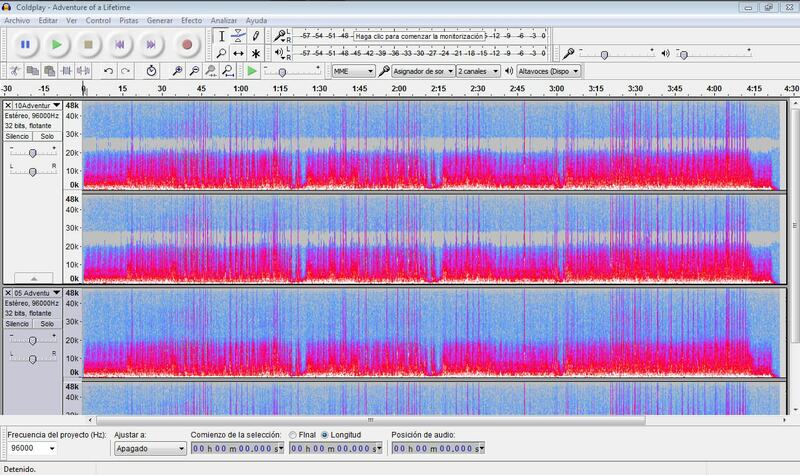 I use Audacity to see the audio spectrum. I'm not an expert as I don't really know how to judge the quality, I just search for differences in the spectrum to judge the better quality audio. Comparing the Ogg to the Flac, I see a 'hole' in the spectrum. What this means? The source material looks like it was CD, but the audio is 96k. Are you trying to upsample ? No, I'm not upsampling. I just take the Flac and convert it to Ogg without changing sample rate or bit depth. I've noticed that all the Ogg that got converted from 24-96 Flac have the same 'hole' in the spectrum in the same Hz range. I've noticed that all the Ogg that got converted from 24-96 Flac have the same 'hole' in the spectrum in the same Hz range. Vorbis removes everything above 20 KHz, so that is normal.